For those of you who have been following the progress of the Renewable Heat Incentive (RHI), it’s a tale of ups and downs. We’d all hoped that the scheme would get the industry going much in the same way as the Feed-in Tariff did for solar panels – although we’re keen to see a better long-term plan than was the case for solar. However up until now we haven’t really had much to get excited about. Delay after delay has a very detrimental effect on an industry. Especially as plenty of customers are putting off installations to see what they will actually be entitled to. Well the good news is that this week we had an official announcement and a nice set of figures to get excited about. Air source heat pumps will be paid at 7.3p per kWh, ground source at 18.8p per kWh and solar thermal at least 19.2p per kWh hour. The amount of energy installers will be paid for will be based on the renewable energy their household generates. So the performance coefficients are important here; if a heat pump has coefficient of 3.5 it will generate 3.5 units of renewable energy for each unit of electricity it uses. The 3.5 units will be entitled to payments, and the 1 unit of electricity will be discounted. What about dual heating systems? So Not All Households Will Need A Meter? If you’re not willing to, or don’t have the space, to install a meter you don’t have to. Estimated figures will be taken from your EPC and green deal assessment to workout how much renewable energy you will generate. If you are interested in installing a meter to get a more accurate payment, you can do this. Plus you’ll receive an additional payment of up to £230. At Complete Renewables we’re really excited about the RHI. We believe that it will be the boost needed to get the industry going. Heat pumps represent excellent value for money and can save households hundreds, often more, per year. Even without an incentive they are an excellent option for households looking to reduce their spend on energy. With this additional boost heat pumps will surely come to the straight to the front of the queue when it comes to replacing older less efficient technologies. Posted on July 18, 2013 by Clive Rolison	in Renewable Energy Blog. 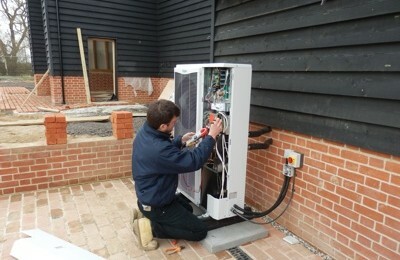 Tags: air source heat pump, energy saving, ground source heat pumps, renewable heat incentive, RHI.